Financial Institutions play a key role in the mobilization of resources in the District. An analysis of financial institutions gives an indication of how local people utilize credit for internal development. Manya Kro Rural Bank at Asesewa. The former has an agency at Kpong and the latter has opened two agencies at Koforidua. There is also a Ghana Commercial Bank situated at Akuse. Rural banks provide loan facilities to the people, especially traders and farmers. 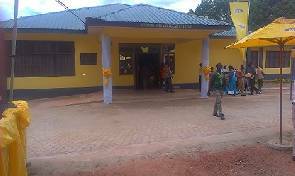 The Upper Manya Kro Rural Bank, in conjunction with two NGOs at Asesewa, provides micro-financing facilities to the people in the surrounding villages. To strengthen mobilization of funds from the communities, the Manya Krobo Rural Bank at Odumase-Krobo has setup a development projects fund. The thrust is to mobilize funds to be saved at the bank. There are also several traditional money lenders or “susu” Collectors in the District. They provide an important service, because most individuals and firms find it difficult accessing credit from the established financial institutions due to lack of the necessary collateral security demanded by banks. y with the health delivery system. There are three government hospitals and one mission hospital in the district. There are four Hospitals, which serve as the first referral points namely: Atua Government. Hospital, Akuse Hospital, St. Martin’s Hospital (Catholic) and Asesewa Hospital. There are 9 private clinics and maternity homes. Chemical sellers, traditional healers, traditional birth attendants and community-based volunteers as well provide health services in the district. Here is the list of secondary school/ senior high schools, Junior high schools, Vocational Schools, Professional Institutions in Manya Krobo district. For details of the schools, click on a links.